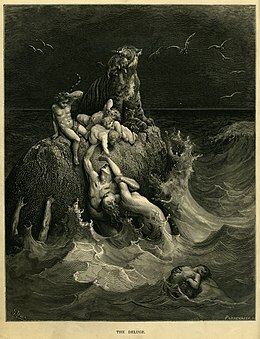 "The Deluge", frontispiece to Gustave Doré's illustrated edition of the Bible. Based on the story of Noah's Ark, this shows humans and a tiger doomed by the flood futilely attempting to save their children and cubs. A Deluge myth or Flood myth is a mythical story about a flood. Usually this flood is sent by a deity to destroy a civilisation as a punishment. The theme can be found in many cultures. Well-known examples that are believed to be myths include the story of Noah's Ark in the Bible, the Hindu Puranic story of Manu, Deucalion in Greek mythology or Utnapishtim in the Epic of Gilgamesh. This page was last changed on 10 September 2016, at 13:18.